Back to “Normal” – 18×24 acrylic on canvas. Not for sale. The compulsion still remains to paint Dad Nelson’s tiny black and white WWII photos. This is my second now. It’s like a mysterious connection. In fact, as Dennis and I stared at this village photo, it was like we were there with his dad while he paused in front of the scene and clicked the shutter on the camera. Imagine if you could have told Dad then that 70 years later the wife of one of his four yet-to-be-born sons would intently study this image and paint it. Wow. History and Time are strange things. 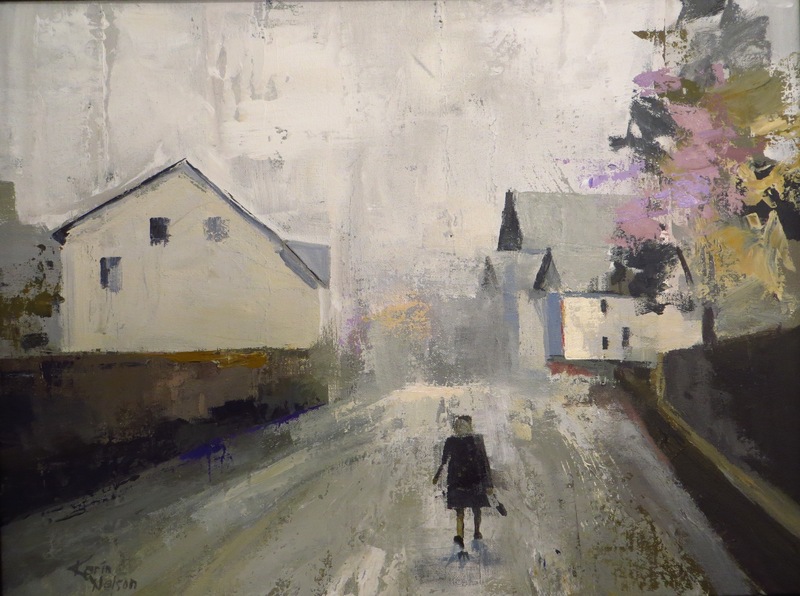 This scene depicts a child en route from school. Although we don’t know the location of the village (Germany, France, England?) there were clues that this was post-war. To me, this painting is all about the child. As a parent, one of the hardest facets to consider about war is its effect on the children. My father-in-law told the story of how he had the difficult assignment, after victory had been achieved, of informing a homeowner that her house was being claimed for use by the military while the soldiers stayed a few months to regain/maintain order. Etched in his mind was the memory of the mother’s reaction upon hearing the news, and her pleading: “Meine kinder (my children)!” If you knew Rex’s tender heart, you could imagine how hard that was. I’ve titled this painting Back to “Normal.” 18×24 acrylic on canvas, NFS. The first WWII painting with its story can be found in my blog HERE. It’s titled Waiting. Absolutely love the historical themes involving your family’s personal history and WW II history. Amazing task you e taken on to bring these photos to life in a fresh way. I wish Rex was still with us to see these. They would bring tears to his eyes…. To know his children and grandchildren appreciate what he and his corp did, that they can SEE and feel what it was like. Karin, you are an absolute jewel ! Thank you for sharing these. Your paintings are beautiful and poignant.